The decision to have LASIK is a big one. It’s what most would call a “life-changer.” It’s transformational. You are choosing to see in a different way and that’s a big deal! For most LASIK patients, the thought of being able to just wake up and see are almost surreal. What will you do first with your new eyes? To get 20/20 without glasses or contacts by having LASIK, your first step is a consultation at 20/20 Institute with our experienced LASIK specialists. A 20/20 Institute LASIK consultation is like no other Doctor’s office visit. The 20/20 Institute doctors along with their attentive and highly trained staff will assist you every step of the way. You will learn about your candidacy for LASIK, and, if you are a good candidate, they will make sure that you know about everything you need to know about LASIK – even if you do not know yet the questions to ask. One of the things that you will learn about is the follow up care after LASIK. 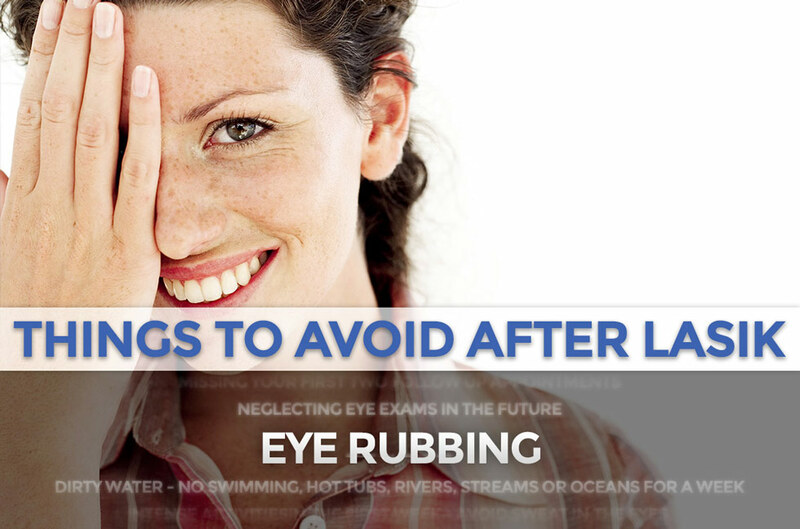 As in any medical procedure, there are things that patients should do and things that patients should avoid doing after having LASIK to help ensure good healing. The doctors will prescribe you two different medicine eye drops and give you directions on their use for about a week after LASIK. Artificial tears help you heal as well, so you will use a lot of those after LASIK. But the directive from our doctors and staff that is usually most welcomed is sleep. You will be asked to sleep at least two to three hours after LASIK. Doctor’s orders! 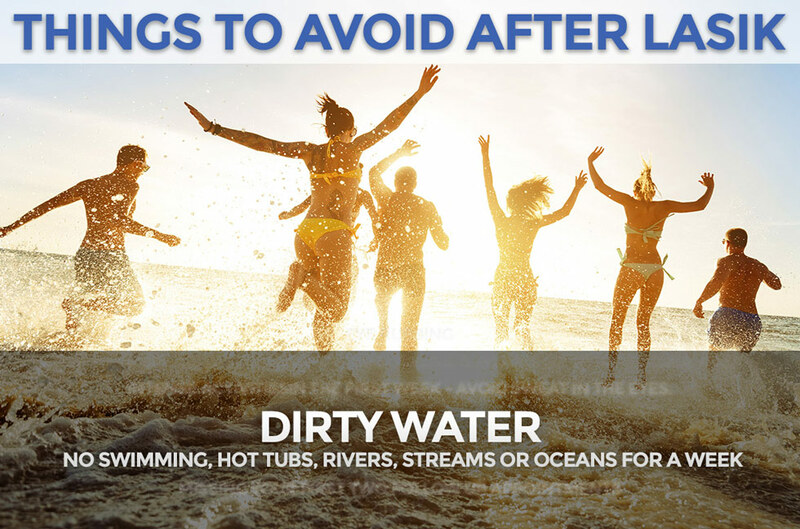 The list of things to avoid is relatively short as well, but we will use this blog post to explain them. First of all, when you wake up from your nap, don’t reach in your eyes to pull your contacts out. They’re not there! And over the first several days after LASIK, it is absolutely normal to be ‘overly appreciative’ of your new vision, but do try to not be too annoying to your friends by continually asking them if they can see things as far away as you can! What should a LASIK patient do if they get an eyelash or a particle of dust in the eye during the first couple weeks after having LASIK? It’s pretty simple actually – flush the eye with the artificial tears. That will get the intruder out with no rubbing. Patients can shower normally after LASIK and will be asked to simply avoid shower stream directly to the face, washing the eyelids directly, and drying the eyelids afterwards. Our 20/20 team will ask that you avoid eye makeup for a few days after LASIK, and that when you do go back to wearing eye makeup, that you remove it with a downward motion only for a couple weeks. And the pros at 20/20 Institute have you covered with the sleeping concern. You will receive a set of super awesome sleeping goggles to wear when napping or at bedtime for the first few days, and these very attractive goggles will help you keep your fingers out of your eyes. To help keep your eyes safe after LASIK, the doctors at 20/20 Institute will ask that you avoid sources of dirty water for at least a week. Your antibiotic eye drops are very powerful and do a great job at preventing infection, but most people fully understand that swimming pools and hot tubs are near the top of bacteria’s list of favorite environments, so it is best to stay away from them for about a week. So no swimming pools, hot tubs, rivers, streams or oceans for at least one week after your LASIK procedure. Many LASIK patients have travel plans after their LASIK procedure and wonder if there are any restrictions related to air travel. The first week after LASIK is the more critical time for healing so the doctors at 20/20 will ask that you do not travel outside of the US during the first week. 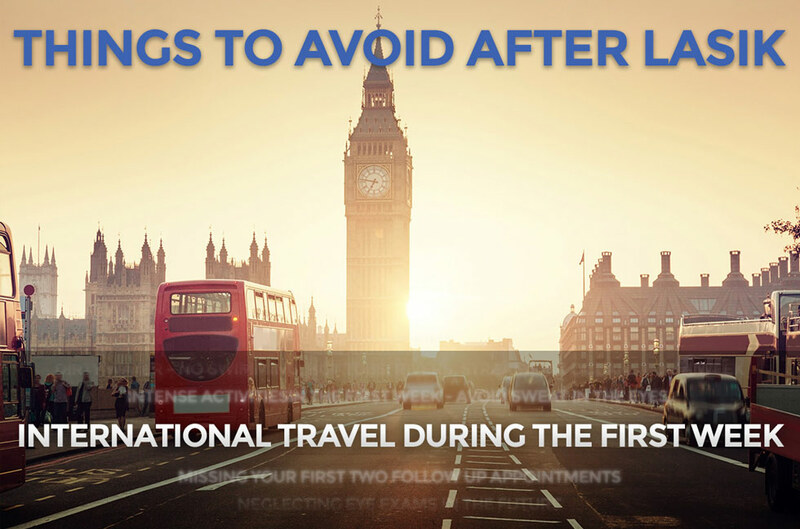 Patients are safe to travel domestically during the first week after LASIK though, and we customarily recommend having an ample supply of artificial tears for the trip because of the dry forced air on airplanes. The tears will help you stay comfortable. Speaking of the first week after LASIK, you will have two checkup visits within the first week after LASIK and they are not optional visits. It is important that the LASIK Specialists at 20/20 see you for both of these appointments to make certain that you are healing well. The first visit will be the day after your LASIK day and the second one will be within the week after. During your first week with your new vision, our doctors will ask you to take it easy with exercise activities. You are welcome to enjoy light exercise, but avoid the heavy duty workout that makes you sweat enough where you might get sweat in your eyes. So keep up the activity at a light level for the first week and wait to break your bench press record until after your second follow up visit. After having LASIK, do not start treating your eyes like you probably currently treat your ears and think that having regular eye exams are no longer important. If a person doesn’t hear well, they go get a hearing examination to find out what is going on. Similarly, when a person doesn’t see well, they go to an eye doctor to address the problem. The truth is that eye exams are highly recommended even for people who see well. Maintaining ocular health is important, and eye exams are the way to do that. Sometimes even general health issues like diabetes are first diagnosed in a routine eye exam, so eye exams are important for your whole body. So after you have LASIK, do not say goodbye to your regular eye doctor and keep up with your regular visits. Back to the “to-do” list for a moment: Enjoy your new vision! Vision is one of our very precious senses, and the LASIK Specialists at 20/20 Institute value the privilege of helping patients live life free of glasses and contact lenses. 20/20 Institute doctors are, most importantly, deeply committed to the long term ocular health of all people that they have the pleasure of meeting for a LASIK consultation. A convenient and comfortable consultation visit with 20/20 Institute will tell you if you are a good candidate for LASIK and therefore should consider the list of do’s and don’ts that we have shared here, or if you are not a good candidate for LASIK and should continue enjoying good vision with the help of glasses or contact lenses. To schedule your free LASIK consultation, call 20/20 Institute at 303.2020.NOW (669) or let us know to contact you, and one of our experienced LASIK counselors will reach out to help you find a convenient time for your first visit to 20/20 Institute.